False Prophet began in the late 80's under the name Abattoir and later Infernal Hierarchy (under which they released a single). 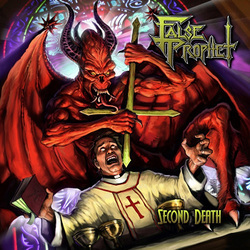 They eventually became False Prophet and released a demo and a full length album called Second Death in 1991. Fast forward to 2013 when they were approached by Heaven And Hell Records to re-release the earlier music. This is the end work of that release and features the single, demo and of course the first 6 track full length album all on one CD. These North Carolina natives have fused some uncompromising and brutal death metal with a bit of angry thrash to form a quite listenable hybrid of metal. This sounds straight out of the early dawn of death metal and has a nice Dark Angel meets Morbid Angel or Death meets Kreator type of feel to it. The music itself isn't overly original and for some reason the band really enjoys playing some monstrously long tracks for death or thrash metal with one quarter of the tracks clocking in at close to ten minutes or longer! Interspersed amongst these lengthy numbers are some really short ones so they do not stick to the usual verse-chorus-verse format (could we call this progressive death thrash? nahhhh)! The CD starts with an intro that is truly well named - Diabolic Rites is an evil and occult ritual that pulls no punches and lets you know exactly what you got yourself into when you hit the play button, talk about setting the tone! The rest is down and dirty satanic metal that does the outstanding cover artwork a great justice. Songs such as In Satan's Name, Sign Of The Cross and False Prophecy really paint an excellent picture on what the band is all about lyrically. Personally the long songs are interestingly some of the better tracks on the album but just a bit too long. I think going forward if this band was to do some new music they would probably do best crafting songs around six or seven minutes long as the long songs don't quite know when it's time to end and the short ones end before they really can leave a mark. Other than that though the band has a really stellar vibe that really captures that 80's feel before genre diversification really started to splinter the metal legions. Metal was metal and that was that! !